In July 1855, a Select Committee on Metropolitan Communications published its report on how best to improve London’s chronic traffic congestion. One of the proposals came from Joseph Paxton, celebrated designer of the Crystal Palace in 1851. 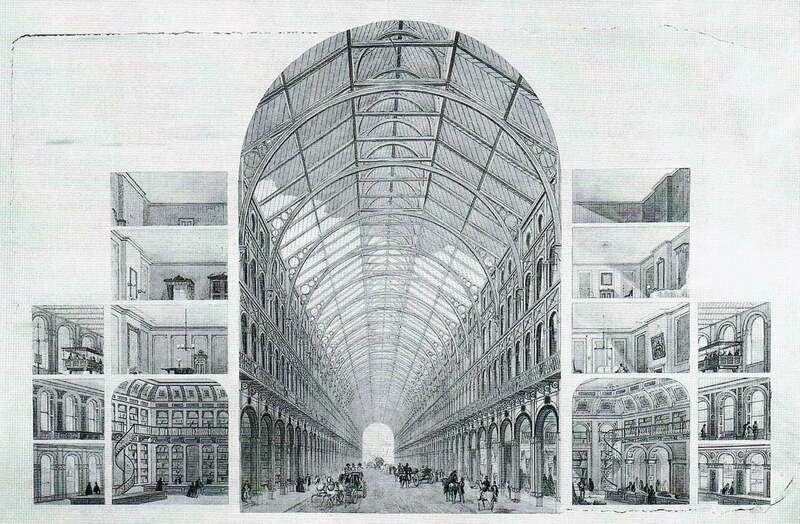 Paxton’s plan comprised a vast iron and glass arcade, which would form an uninterrupted covered space of 10 miles around central London: the ‘Great Victorian Way’ (1). Unsurprisingly, given its projected cost of £11 million, the Committee decided not to adopt this scheme, despite Paxton’s high reputation, and would later choose a far less ambitious underground railway, which was built from 1859-63. Despite the failure of utopian projects like Paxton’s, the idea of a micro-city under glass and iron persisted in the second half of the 19th century. Although never realised on the kind of scale envisaged by Paxton, there were attempts to create sealed environments offering protection from both the elements and the chaos of the street, most notably in the countless shopping arcades that were built in Victorian towns and cities. 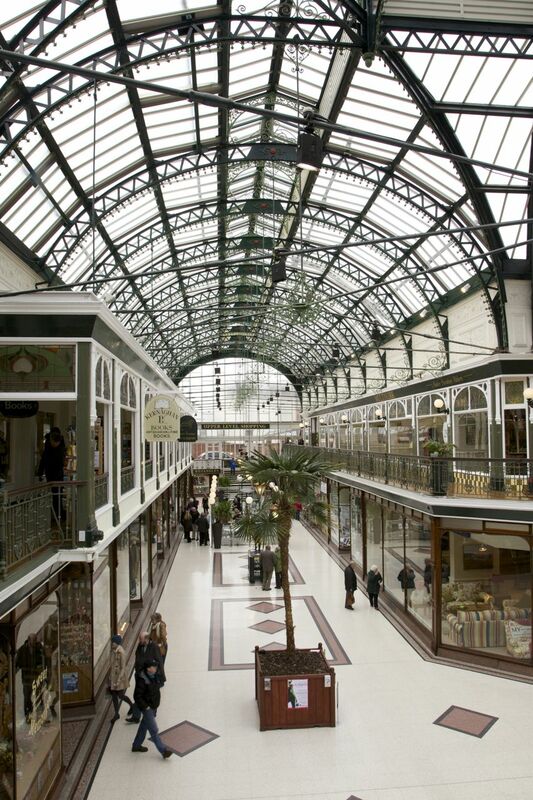 One of these – the Wayfarer’s Arcade in Southport – was designed to integrate into an already existing network of covered walkways. 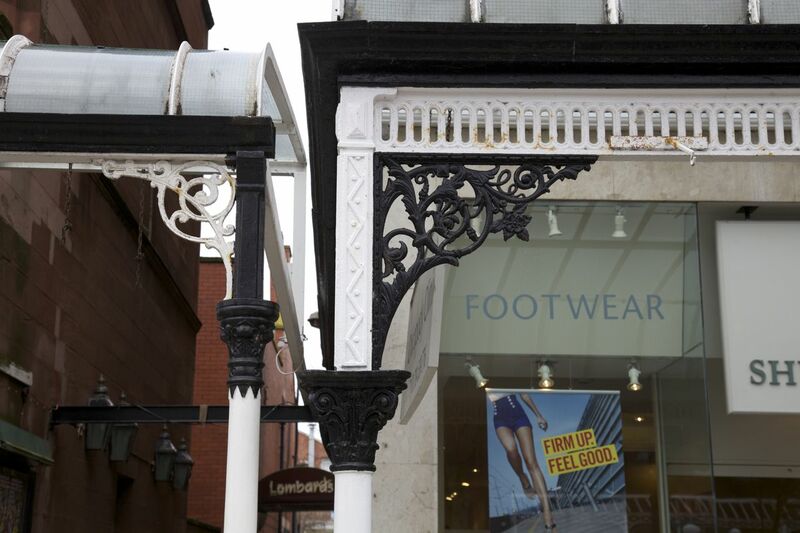 Built in 1896 by the Scottish iron manufacturer Walter Macfarlane, this arcade extends the concept of the canopy beyond the street, creating a new enclosed space between two buildings fronting Lord Street (2). In fact, Lord Street itself is unique in its scale in the Victorian period. 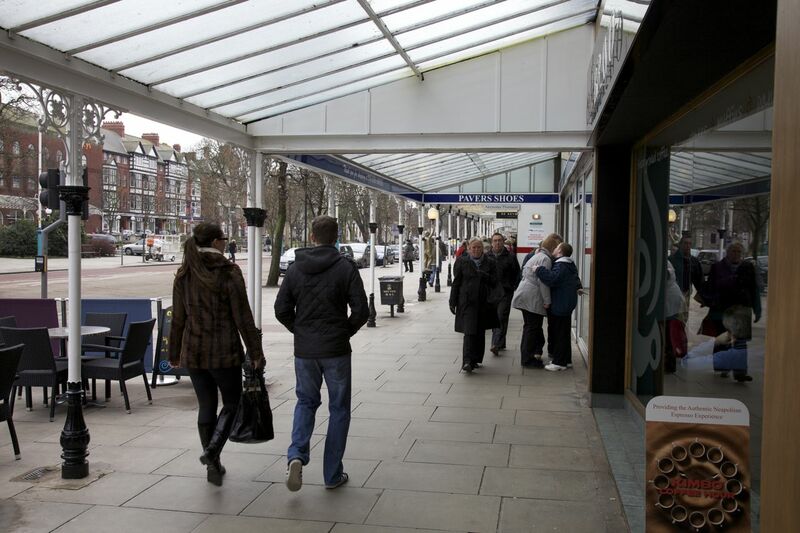 For over half a mile, covered canopies project from the shops creating an almost continuous shelter for shoppers in the unpredictable seaside weather of north-west England (3). These canopies were not built by a central municipal authority (as would have been the case if Paxton’s proposal had been built), but by individual property owners responding to demand. One at a time, and presumably in competition with one another, each property owner acquired a canopy for their premises, employing a host of mainly Glasgow-based iron manufacturers to produce ornamental cast-iron columns and railings. So the castings of Walter Macfarlane sit next to those of J & A Law (4); those of McDowell, Steven & Co sit next to George Smith (5). Different-sized columns sit side by side in what amounts to an exhibition of the ironfounders technique. The result is a sense of unity in diversity, with each company vying with its competitors to produce the most elaborate designs to attract customers and heighten the esteem of the property owners. It is almost as if the resulting covered arcade is an accident, achieved piecemeal over the years by the principles of free competition. 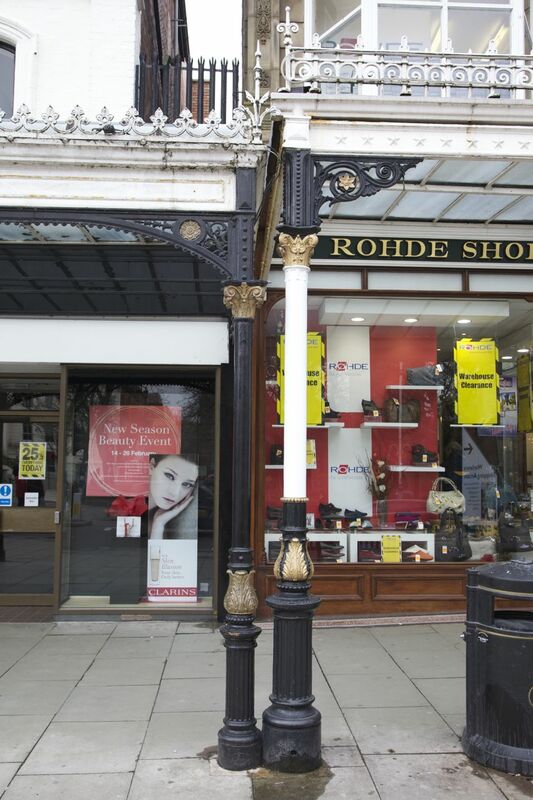 If Southport’s Lord Street represents the part-realisation of utopian dreams in relation to iron and glass, other seaside resorts had similar ambitions. 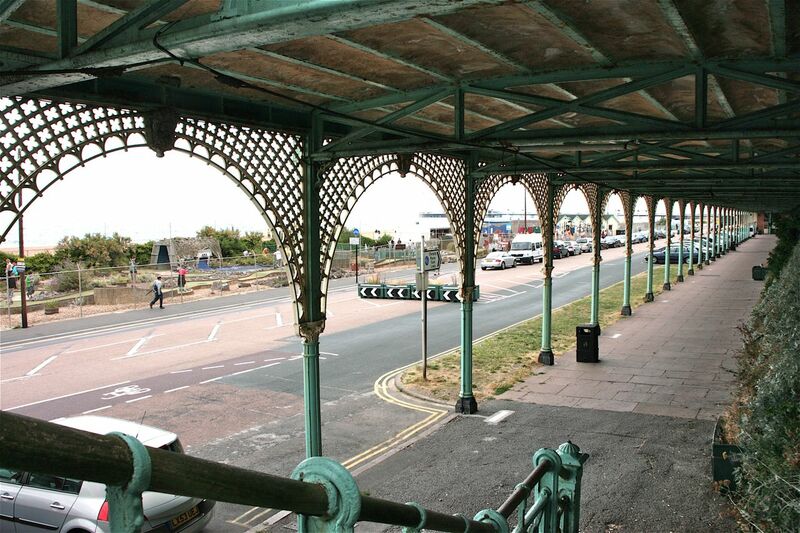 As early as 1874, Walter Macfarlane proposed building a mile-long iron colonnade under the cliffs in Brighton. This was never built, but its concept was revived 25 years later in the construction of Madeira Drive (6), a vast covered walkway that formed part of the wholesale re-sculpting of the cliffs to the east of the Palace Pier, which included terraced walkways and an elevator at the eastern end. All of this was the product of cast iron being produced and employed on an industrial scale for decorative purposes. The resulting colonnade was likened to a enormous grotto, hewn from the cliff and emblazoned with mythic subjects: Neptune, acanthus leaves, and water nymphs. This was iron remaking nature into a modern, progressive space but simultaneously adopting the image of an ancient and mythic past. They certainly had an eye for detail. Paddington Station and more recently the refurbished St Pancras blow my mind with the skill and intricacy of the designs and engineering prowess. Fascinating post. Many thanks.